Ministry Of Interior Saudi Arabia website recently avail the permanent family visa service online for the expatriates living in the kingdom. Check your MOI whether you are eligible for Permanent Family Visa Service or not. - Login to your Ministry Of Interior MOI Abshir account. Go to "E-SERVICES". In the left menu you can see "ISTIQDAM", When you click on it, You can see two options, First is "Family Visa Service" and the second is "Book an Appointment". - Family Visa Service option lets you make online application for permanent family visa. However as it is newly launched, It is not letting all expats to proceed with it. 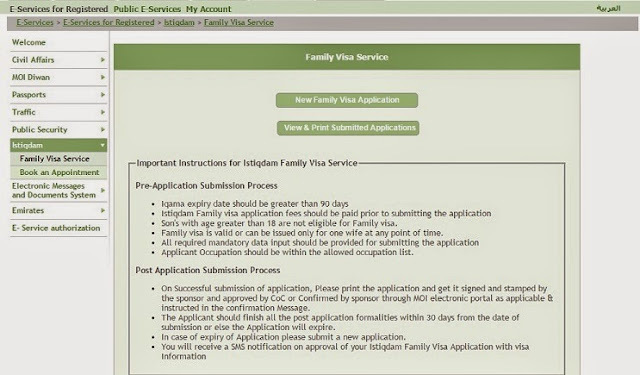 Before you proceed with new Family visa service application, It is recommended to read all the instructions carefully. 1. Iqama should have a minimum validity of 3 months. 2. Istiqdam Family visa fees should be paid before submitting the application. 3. Sons above 18 are not eligible for family visa. 4. Family visa can be issued only for one wife at any point of time. 5. All required information should be provided for submitting family visa application. 6. Applicant profession should be with in eligible profession list. 1. Once your submission success, Print the application and attest (sign and stamp) from your sponsor and approved by Chamber Of Commerce. 2. Finish all application formalities within 30 days starting from date of submission, Else your application will expire. 3. In case of family visa application expire, Submit a new application. 4. You will notified through SMS with visa details on approval of your family visa application from istiqdam. what is the next step after approval of application and receiving sms from chamber of commerce.? You can print it by logging into your MOI account, And Send home for stamping. No, you must wait (4 days at max) for the visa to appear on MOFA website. after it appears there, send that VISA paper for stamping in your country. You must wait for the visa to appear on MOFA website; after it appears there you can send it to your country for stamping. How much time is this issued visa valid before stamping it on the passport. My profession on IQAMA is electrical technician(fanni kaharbayi) and i am getting an error message for Istiqdam I want to know does this profession allows family visa. If any attested certificates need for getting online permanent family visa.